You can use styles to quickly apply a set of formatting choices consistently throughout your document. 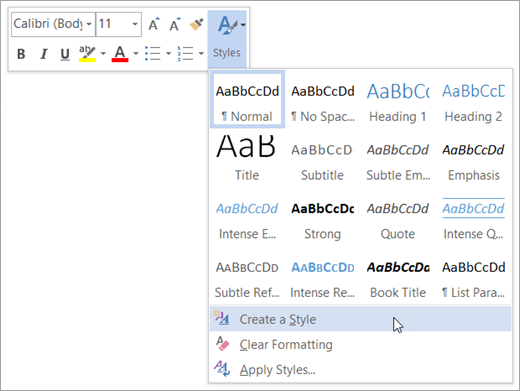 If you want formatting choices that are not available from the built-in styles and themes available in Word, you can modify an existing style and customize it to suit your needs. You can change the formatting (such as font size, color, and text indentation) in styles applied to titles, headings, paragraphs, lists, and so on. You can also select formatted text in your document to create a new style in the Styles gallery. The styles covered in this article are located in the Styles gallery, a visual menu located on the Home tab. To apply a style, simply select the text you want to format, and then click the style you want in the Styles gallery. To learn more, see Apply a style to text in Word. If you have text in your document that already has a style applied, you can change the formatting of that text and apply it to the style in the Styles gallery. Select text in your document that has the style applied, such as Heading 1. When you select text that has a style applied, that style is highlighted in the Styles gallery. Format the selected text with the new attributes that you want. For example, you might want to change the point size for the Heading 1 style from 16 points to 14 points. On the Home tab, in the Styles group, right-click the style that you want to change, and then click Update [Style Name] to Match Selection. Note: All text with the style that you changed will automatically change to match the new style that you defined. You can modify a style directly in the Styles gallery, without using the text in your document. On the Home tab, right-click any style in the Styles gallery and click Modify. In the Formatting section, make any formatting changes you want, such as font style, size, or color, alignment, line spacing, or indentation. Choose whether the style change applies to the current document or to all future documents. You can select formatted text in your document to create a new style that you add to the Styles gallery. Right-click the text on which you want to base a new style. In the mini toolbar that appears, click Styles, and then click Create a Style. In the Create New Style from Formatting dialog box, give your style a name and click OK. Your new style will now appear in the Styles gallery. Note: If you want your new style to appear in all new Word documents, right-click it in the Styles gallery, click Modify, and then select New documents based on this template at the bottom of the dialog box. Right-click the text on which you want to base a new style, point to Styles, and then click Save Selection as a New Quick Style.